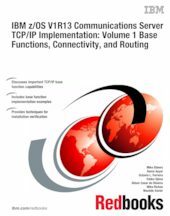 This IBM Redbooks® publication is for people who install and support z/OS Communications Server. It introduces z/OS Communications Server TCP/IP, discusses the system resolver, showing implementation of global and local settings for single and multi-stack environments. It presents implementation scenarios for TCP/IP base functions, connectivity, routing, virtual MAC support, and sysplex subplexing.